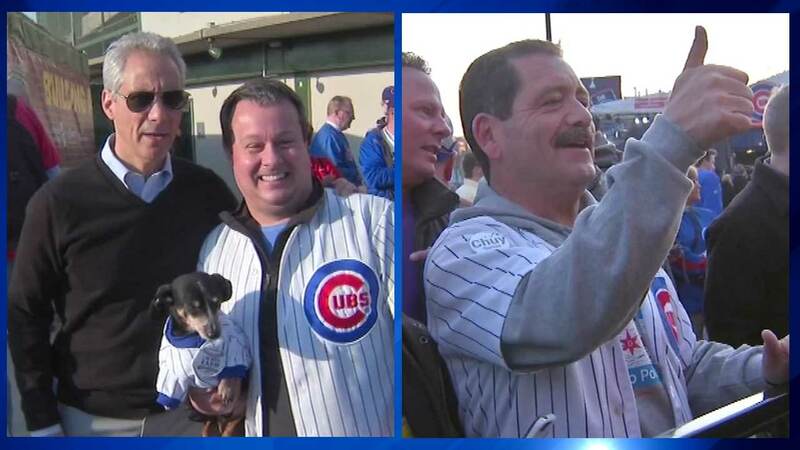 CHICAGO (WLS) -- Both candidates in Chicago's first ever mayoral runoff election Tuesday were out at Wrigley Field for the Cubs season opener Sunday night. Challenger Jesus "Chuy" Garcia and Mayor Rahm Emanuel walked around the "Friendly Confines" shaking hands and taking pictures. The candidates are trying to sway any undecided voters. "A new promise," Garcia said. "Today begins new hope in our faith and of course we cast our faith with the Cubs in 2015." While Garcia was focused on the game, Emanuel responded to a question of whether or not he's changed in office. "If we knew in the first year of the first term what by the first year of the second term we would be really smart," the mayor said. "So, you learn along the way. Of course I've changed and more importantly than change, I've learned from my mistakes." Earlier on Sunday, Garcia first visited a church in the Little Village neighborhood, then another on the city's South Side. Emanuel was also at a South Side church Sunday morning. He spoke to the congregation at Monument Faith Church in the Ashburn neighborhood. The ABC7 Eyewitness News team will have complete election coverage Tuesday when the polls close at 7 p.m. with Eyewitness News on the "U," plus live updates throughout the night on ABC7, Facebook, Twitter and ABC7 Chicago's news apps. You can also get a complete recap on Eyewitness News at 10 p.m.